Whether you golf or hunt, there are hundreds of different rangefinders to choose from. Featuring technical specifications more advanced than the first NASA spaceship, it can be incredibly tough to pick the right rangefinder. This is where my ultimate review of the Bushnell Yardage Pro Sport 450 comes into play. I will be discussing everything you need to know about this rangefinder from Bushnell. The Bushnell Yardage Pro 450 has been on the market for quite some time, but don’t think it is long in the tooth. It is an effective rangefinder, and can be used at distances of up to 999 yards, with a very good 320ft field of view at 100 yards. To be honest though, I have found that it becomes hard to use outside of 200 yards. This wasn’t a big problem for me, because I use it when I play golf. And when I am more than 200 yards out, I am not too bothered about accurate yardages. If you need a rangefinder accurate for those larger distances, I recommend you check out the newer model, the Bushnell Sport 850 4x 20mm 1-Button Operation Compact Laser Rangefinder. Imagine yourself in your Sunday fourball, standing over the ball. It all comes down to your approach on the 18th. Somehow you just can’t decide whether it is a 7 or 8 iron to stick it close to the pin. You whip out your Bushnell Yardage Pro Sport 450 Rangefinder, find the flag, and now you know it is the perfect 8 iron distance. With full confidence that you have the right club in your hand, you make a good swing with nice tempo, and…. 7 feet to the pin, baby! Your partner drowns the putt, and the skin is yours. But you know the money doesn’t really matter. Making that shot, with all the pressure on, in front of your competitors, that is the stuff that dreams are made of! At less than $200, the Yardage Pro Sport 450 packs an impressive list of features. Is the Pro Sport 450 right for you? If you are looking for a rangefinder to use on the golf course, and your budget is limited, you will be hard pressed to find a better unit than the Pro Sport 450. Sure, it has some limitations, but you can’t beat that price tag. This unit is one of the best rangefinders for the money available today. Let me know if you decide on buying one, I would love to hear your thoughts. 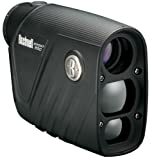 Check out the bushnell yardage pro sport 450 laser rangefinder on Amazon by clicking on the link below.